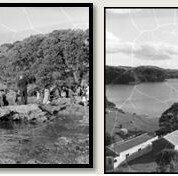 These photos are from sometime in the 1950s, before the “back road” reached Te Rawhiti. Then, a favoured way to get to Rawhiti was by boat. The service was probably much the same as now, ditto the thoughts and memories of those in attendance. What was different though, was the stroll up from the beach to the marae grounds. See the nice gentle slope in the picture? It’s gone. Different too would have been the sense of seclusion for this and many other significant and meaningful occasions. Privacy disappeared when the road crossed in front of the marae. Could it have followed a different route? Whose decision was it? These photos and an answer to those and many other questions can be found on the walls of Russell Museum’s King gallery. Our latest exhibition, ” Still Unsettled – Ngā Hapū o Te Rawhiti” explores the stories behind the journey of the hapū to their recent Waitangi Tribunal hearings. Come and visit. And prepare to be unsettled.